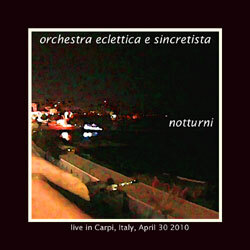 This album consists of two live performances of the same body of work, performed on the same ay at the same venue, in Carpi, Italy, on April 30, 2010. Visit www.musichevirtuali.org for more information about Marco Lucchi and o.e.s. This entry was posted in Catalog and tagged acoustic, avant-garde, Catalog, Experimental, live, Marco Lucchi, Releases by C.P. McDill. Bookmark the permalink.